When most people consider the consequences of vitamin C deficiency, however, the usual image that comes to mind is of a scurvy ridden, orally challenged, 16th century sailor who has run out of limes! While a severe deficiency of vitamin C is rare anymore, subclinical deficiency is most definitely not. Vitamin C is probably best known for its ability to shorten the duration and severity of the common cold as popularized by Dr. Linus Pauling in his 1970 book, Vitamin C and the Common Cold. Found in many fruits and vegetables and in some animal organs, vitamin C is a delicate nutrient that is destroyed by heat. Consequently, in the modern diet where the majority of most people’s meals consist of highly processed fare, little vitamin C remains for absorption. The problem of little natural vitamin C in the heavily processed, modern diet is compounded by the fact that the millions of individuals with blood sugar issues such as hypoglycemia require more vitamin C as this condition interferes with its metabolism by the body. In addition, alcohol consumption and many common drugs such as aspirin and the birth control pill may reduce vitamin C levels in the body. With vitamin C so critical and yet so elusive in the modern diet with higher than normal levels required by many due to metabolic issues or drug interactions, it is no wonder that vitamin C supplements are absolutely everywhere – commonly sold even at gas stations! While vitamin C supplementation is a good idea for most people (I take one myself as do my children and husband), supplementation with just any vitamin C is not. 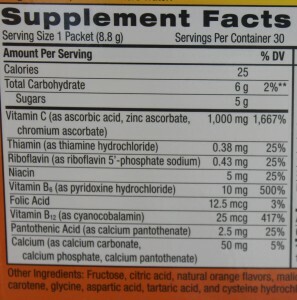 The problem is that most vitamin C is not really vitamin C at all. It is ascorbic acid, a lab synthesized version not found anywhere in nature, which is only one part (the outer layer) of the complete vitamin C complex. Consumption of isolated ascorbic acid is not a good idea on a regular basis. Some evidence suggests that large doses may lead to imbalances and deficiencies in the flavonoids (vitamin P), a powerful family of over 6,000 antioxidants that have a symbiotic working relationship with vitamin C – each increasing the other’s effect. Even more worrisome is that ascorbic acid, while proven to kill bacteria effectively, is not discriminatory in its anti-microbial abilities as it also wipes out good bacteria or probiotics in the gut. Whole foods based vitamin C does not harm beneficial intestinal bacteria in the same way as synthetic vitamin C does. Another wake up call about ascorbic acid – it is synthesized from corn syrup. If you take a vitamin C supplement with ascorbic acid, you guessed it, you are likely consuming a supplement with GMO origins (unless the corn was certified organic) without even knowing it! To show you just how common GMO derived, probiotic destroying ascorbic acid masquerading as true vitamin C is, I took photographs of the labels of three extremely popular vitamin C supplements at the healthfood store. 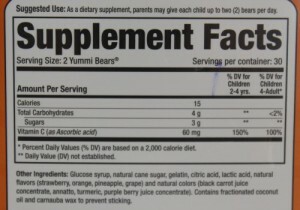 The pictures to the right show that there is no real vitamin C to be found in any of them, even the children’s yummi bears! Given that natural vitamin C is destroyed by heat and that the vast majority of “vitamin C” supplements and foods fortified with “vitamin C” don’t contain any true vitamin C at all, what is a person who needs to supplement with this critical nutrient to do? 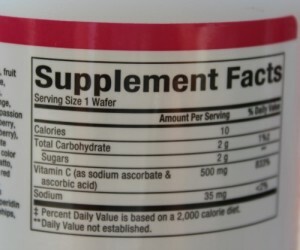 Finding a quality vitamin C supplement is indeed hard! In fact, I didn’t take a vitamin C supplement for years simply because I couldn’t find one that was 100% whole foods based with no additives whatsoever. Every single time I tried one that was “almost” good enough, I would end up stopping it as it would inevitably give me bad headaches. It is only in the past few months that I have finally started to take a vitamin C supplement regularly because at last I found a line that is low heat processed, whole foods based, and entirely additive free. The funny thing is, the products were right under my nose all along and I didn’t even realize it! My friends Norm and Kathy LeMoine of Radiant Life offer a quality line of whole food vitamin C supplements to choose from. The one I’ve been taking and very much enjoying is Pure Radiance C. You simply stir a 1/4-1/2 teaspoon in a some filtered water and drink. It tastes great! You can also hold the vitamin C mixture in your mouth for a minute or so before swallowing to allow vitamin C to absorb directly into the thin and delicate gum tissue. Great for those with periodontal problems. Capsules are also available if desired for added convenience. 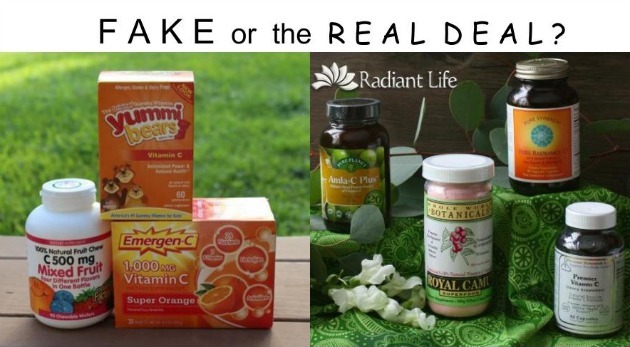 Radiant Life offers three other whole foods vitamin C products with no additives to choose from as well. The difference between the products is the whole food sources of the vitamin C. Choose whichever mix of vitamin C sources suits your nutritional goals best. The chart below illustrates the various product options. If this article has caused you to throw up your hands in dismay because the vitamin C you had chosen for your family turned out to be synthetic and probably of GMO origins, don’t despair! Move forward with the newfound knowledge that vitamin C from a whole foods supplement with zero additives is in fact available and that there is a company you can trust which offers four superior forms of this important nutrient for you to choose from.